Talk about Serendipity! In the late summer of 1988, singer/actor Greg Edelman had to pass on a new production of Side By Side By Sondheim being staged at the Asolo Theatre in Sarasota, Florida by a young director named Rob Marshall. Kurt got a last minute call, met and sang for Rob...and got the job. 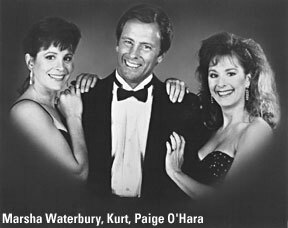 He would be part of a cast of three including Paige O'Hara and Marsha Waterbury. It became clear early in the rehearsals that Rob Marshall was something special. His knowledge of the material, skill, patience, encouragement and enormous talent made the process a joy and this Side By Side an exceptional show. After the Sarasota run, Kurt worked with Rob to mount a production to show to Columbia Artists and they promptly signed on as the booking agent for a National tour. With Rob as director and Kurt as producer and performer, the show toured for the next three years playing to over 60 cities. During that time many leading ladies came and went, including: SuEllen Estey, Diane Fratantoni, Kim Kriswell, Judy McLane, Michele Ragusa and Virginia Sandifur. Rob would patiently rehearse each new lady and kept the show tight for the entire tour. It is no surprise that Rob Marshall has become one of our most important directors.